The Princess And The Pee: What’s Really Disrupting Our Sleep? 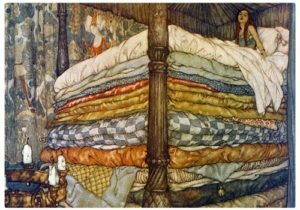 Hans Christian Andersen’s classic fairy tale is about a young girl whose sleep is disrupted by a pea tucked beneath a stack of twenty mattresses. Her heightened sensitivity to the pea was understood to be a sign of royalty. Could it be that we all become royal in our sleep? Night’s deep stillness coupled with sleep’s inherent vulnerability heighten our sensitivity to both external and internal stimuli. Especially the call of the bladder. Frequent nighttime urination, nocturia, is a problem for millions of us. Defined as a need to urinate two or more times during sleep, nocturia is common among adults of all ages and is experienced by 50–60% of those over the age of 60. Because we are sensitive to even small amounts of urine in our bladders at night, people with insomnia frequently blame their bladders for disrupted sleep. What Really Wakes Us Up? Although some of our nighttime awakenings may, in fact, be due to a full bladder, more often the real culprit isn’t apparent. Just as Andersen’s princess was unaware of the cause of her sleeplessness, most sleep disrupters awaken us then quickly slip undercover, under the mattress. It’s not a pea or pee, but a number of common medical and lifestyle factors that surreptitiously disrupt our sleep. Common sleep disrupters include gastroesophogeal reflux (GERD), periodic limb movements (PLMS), the side effects of medications, excessive alcohol and caffeine consumption, and breathing difficulties. Although most people are now familiar with this list, they may be surprised that the onset of REM sleep, or dreaming, can also rouse us from sleep. Many of us bolt from sleep when we sense the arrival of emotion-laden dreams, though we remain unaware of why we have wakened. What Really Keeps Us Up? To address our disrupted sleep, we must begin with this recognition: What wakes us up is not typically what keeps us up. Let’s take our bladders. Unless we’re urinating for impossibly long stretches, our bladders are not to blame. It’s perfectly normal to get up, pee, and slip back to sleep. If we can’t manage to get back to sleep after minor disruptions, we should examine our psychological reactions to being awake at night. Greeting a momentary awakening with negative thoughts can transform a minor sleep disruption into a protracted bout with insomnia. Examples of such negative thoughts include: (1) the expectation that we should always sleep through the night, (2) the assumption that even occasional awakenings means we have insomnia, (3) the concern that any loss of sleep will erode our health, (4) the belief that it’s urgent to fight our way back to sleep, and (5) the fear that we will have a terrible day if we don’t immediately return to sleep. If we are, indeed, all royal in our sleep, let’s treat ourselves like royalty. Commit to getting the pea (or can of peas, as the case may be) out from under the mattress. Begin by seeing a primary care provider to rule out medical sleep disrupters, especially GERD, PLMS, medication side effects, and breathing difficulties. And experiment with systematically curtailing alcohol and caffeine consumption, noting its effect on your sleep. Symptoms of nocturia can sometimes be managed with lifestyle changes such as limiting the intake of fluids in the evening and curtailing the consumption of caffeinated and alcoholic beverages. Recent research has shown that 2 mg of melatonin prior to bedtime significantly reduced nocturia in older men and women. If these interventions are insufficient, your doctor may suggest medication. Receptivity to dreams reduces the tendency to awaken from them. Dreaming supports learning, memory, and positive mood. Attending to dreams encourages our personal and spiritual development. Just as challenging experiences are part of a good life, challenging or bad dreams are part of a good dream life. And, finally, we can benefit from exploring our attitudes toward nighttime awakenings and developing effective strategies for getting back to sleep. Extensive historical research suggests that being awake for a stretch of time in the middle of the night is normal and not unhealthy as long as we get enough total sleep time. Anxiety around getting back to sleep inadvertently tethers us to our waking self, which by definition cannot sleep. Acceptance of nighttime awakenings reduces this anxiety and, paradoxically, helps us get back to sleep.